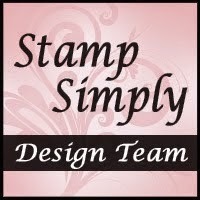 For today's card I am using the Thinking of You stamp set from JustRite Stampers. This set includes six borders and centers with some beautiful images to color too. 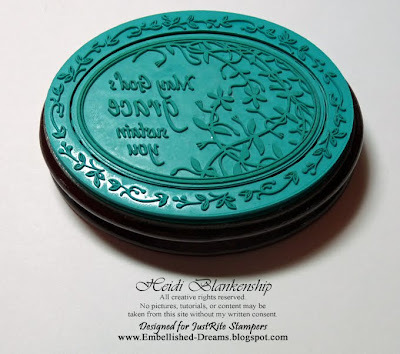 The Thinking of You stamp set fits the 2-1/4'' x 3-1/16'' Oval Wood Stamper. 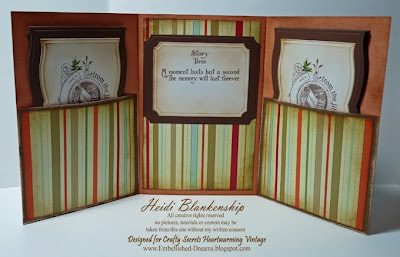 Here is the card I designed using one of the centers and borders from this set. 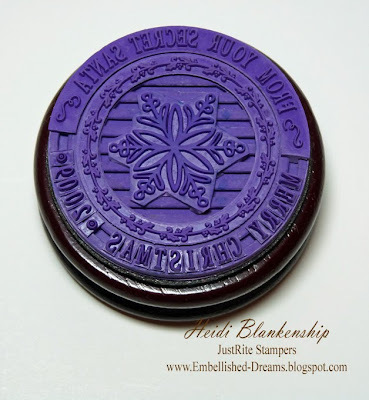 Here is a close up of the stamp so you can see all the details in the images. 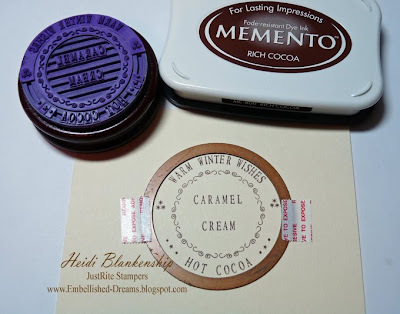 I started out by stamping the sentiment/image using brown ink onto ivory cardstock. 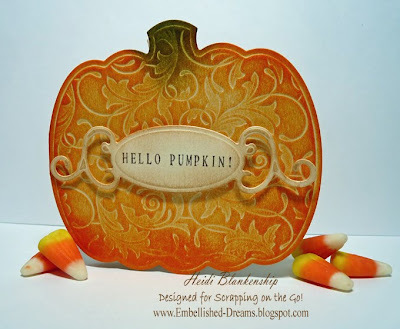 Then I used the Classic Oval Lg S4-110 die template from Spellbinders to make the oval diecut. After I had the diecut made I colored the leaves in the vine and the border around the oval with a Copic marker and then I inked the edges with brown ink. 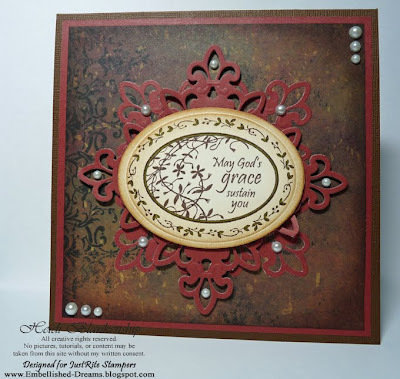 Then for the mat in the background I made two diecuts using the Fleur De Lis Pendants S4-204 die template from Spellbinders. I inked the edges of the designer paper with brown ink and added some pearls. 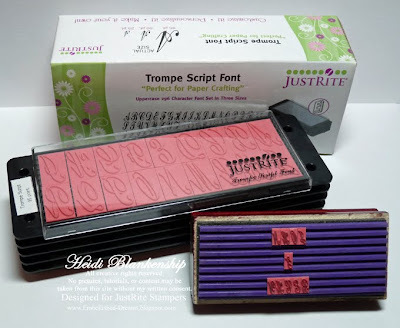 Another thing I wanted to share with you today is how I store my JustRite Stamps. I have had several questions and many emails about storage. Thanks so much for stopping by today! I hope you have a Wonderful Wednesday!! Things are cooling down here in the north and fall is upon us. I love the crisp cool air and prefect sweatshirt weather. The colors of nature are so beautiful in the fall. One of my favorite things in the fall is Halloween! I love Halloween! I love decorating for it and creating for it. 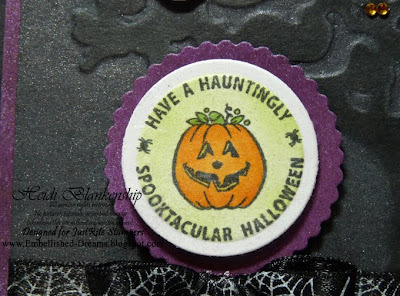 The card I have to share with you today is a cute Halloween card. 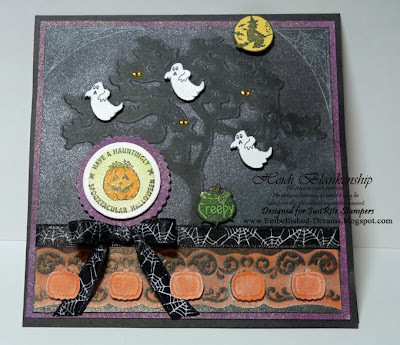 I had a lot of fun creating this card and I used several of the stamps from the Witch Way to the Treats stamp set from JustRite Stampers. 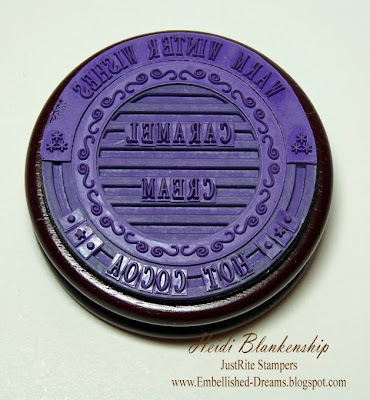 This stamp set includes 10 Borders & Centers and it fits the 1-3/16'' Wood Stamper. 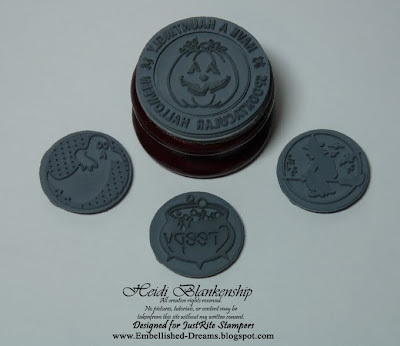 Here is a close up of the stamps I used from this set. Here is a picture of the finished card. I started out with the black paper and making the tree for the background. *See note at bottom of this post. 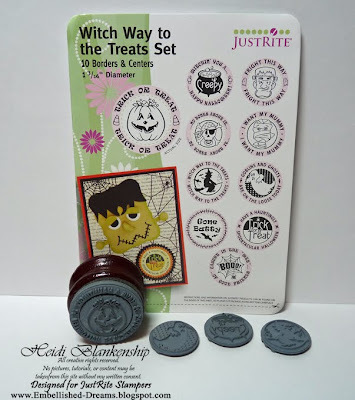 Then I stamped the pumpkin center and border from the Witch Way to the Treats stamp set onto white cardstock and colored with Copic markers. After I had the coloring done I used the Standard Circles Lg S4-114 and Petite Scalloped Circles Lg S4-115 die templates from Spellbinders to make the circle diecuts. 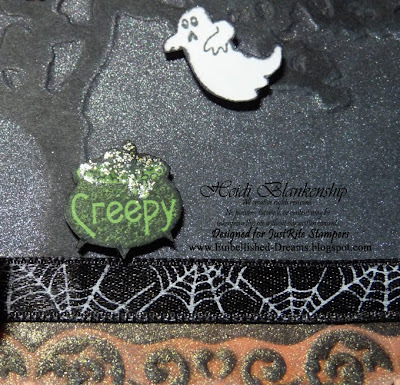 I also used Iridescent Gold Glimmer Mist on the white cardstock and Haunted Shadow Glimmer Mist on the purple cardstock. Next I stamped the creepy cauldron image from the Witch Way to the Treats set with black ink onto green cardstock and cut the image out. I added some green glitter to the bubbles and put foam dots behind it. 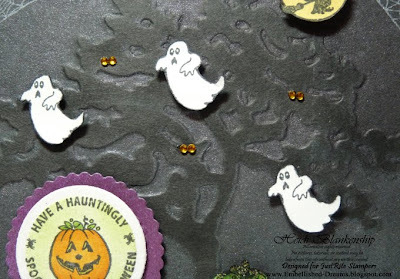 Then I stamped the images of the ghosts from the Witch Way to the Treats set with black ink onto white cardstock and cut out the images and added foam dots so the ghosts would look like they were flying in the sky. I also added some tiny rhinestones for spooky eyes in the tree. *wink* You can't really see it in the picture but I misted the ghosts with Marshmallow Glimmer Mist from Tattered Angels. 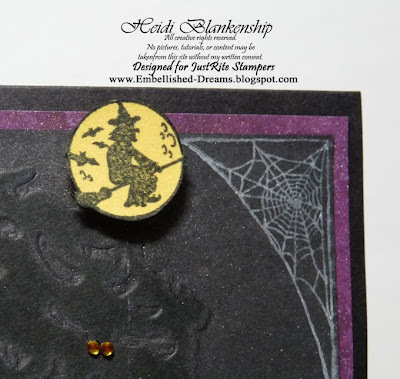 Now a spooky Halloween card wouldn't be complete without a witch flying by the moon so I stamped the image of the witch from the Witch Way to the Treats set with black ink onto yellow cardstock and cut the image out. I added Iridescent Gold Glimmer Mist from Tattered Angels and foam dots. 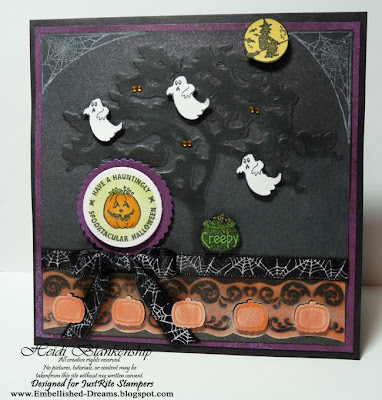 The cobwebs in the corners are from the Halloween Fun stamp set from Crafty Secrets. 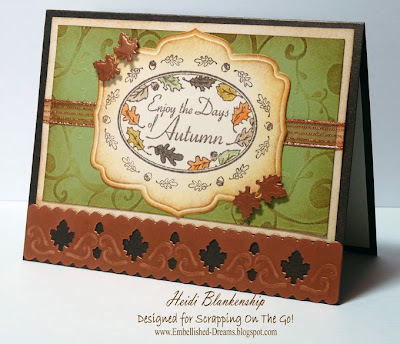 For the border I used the Harvest Border Petites S4-226 die template from Spellbinders with some NEW paper from 3M, Post-it Craft Paper-Orange. *See note at the bottom of this post. 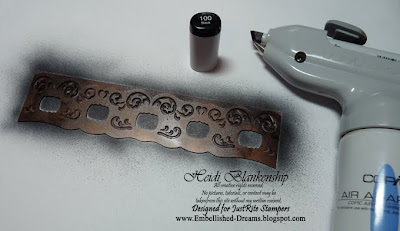 I also used the Copic airbrush system with a black marker to airbrush through the die template. Here is another picture of the finished card, you can see a little more of the shimmer from the Glimmer Mist. Thank you so much for stopping by today! I hope you enjoyed the Halloween card. 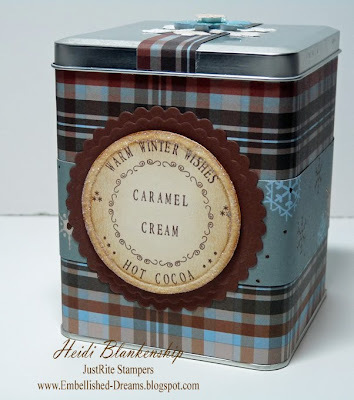 Don't forget to hop on over to the JustRite Blog to find more inspiration for JustRite Stampers! *Note, I will be posting a tutorial on how I created the tree for the background on Thursday or Friday so be sure to check back. I will also be posting more information about the New Post-it Craft Paper very soon. Good morning! 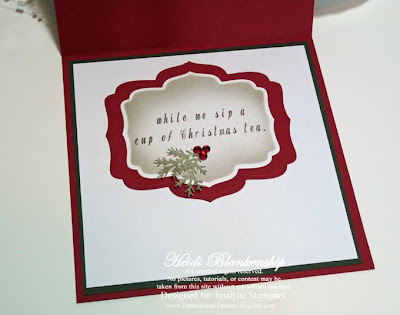 Today is the Crafty Secrets Blog Hop and our Design Team Leader, Vicki Chrisman gave us all a challenge to create a card or project using a stamp set that we haven't used in awhile and if we were making a card it had to have fancy folds or a different size or shape. The inspiration for the card I created came from my youngest son. We have always had stories at bedtime for both the boys ever since they were little. Our oldest son doesn't do the bedtime reading (to us) anymore but he does have a great love for books and spends many hours reading. Our youngest son started reading last year and this year we have a reading log and if he reads 500 minutes within the month he will get a certificate for pizza at a local restaurant. He loves to have and create bookmarks and write his name in the front cover so I created a book label and bookmark set for him along with a pocket card to hold the labels. 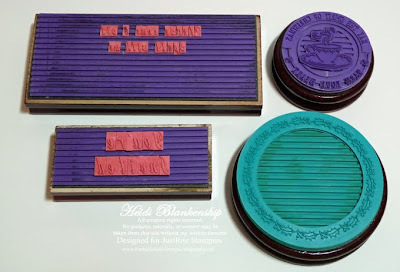 I started out with making the book labels, I used one of the stamps from the Book Lovers Clear Art Stamps from Crafty Secrets, white and brown cardstock and Labels Seven S4-231 from Spellbinders. 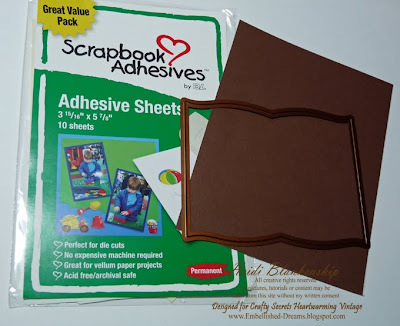 First I took the brown cardstock and applied it to Adhesive Sheets from Scrapbook Adhesives by 3L, I wanted the labels to have a sticker back so my son could easily adhere them into the front cover of his favorite books. 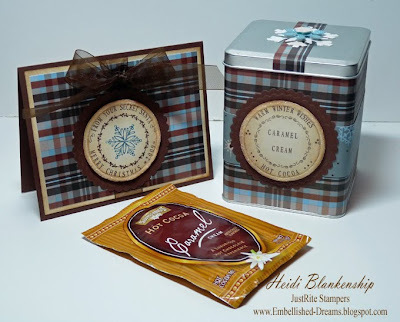 Then I made 12 diecuts with the Labels Seven S4-231 die template from Spellbinders with the brown cardstock. Then I also made 12 more diecuts using the next smaller die template in the set and white cardstock. After I had all of the white diecuts made then I stamped an image in the center with the sentiment From the Library of, colored the leaves with Copic markers, inked the edges and I left the banner blank so my son can write him name in there himself. 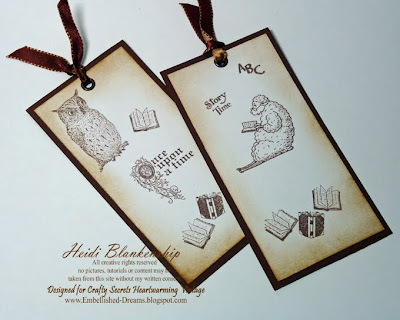 For the bookmarks I just simply stamped images and sentiments from the Book Lovers and Story of Me Clear Art Stamps from Crafty Secrets with brown ink onto white cardstock and left the images so my son can color them. Then I inked the edges, added brown cardstock for a mat and an eyelet and some brown ribbon. For his card I used a piece of brown/orange cardstock from the Core'dinations Chocolate Box Paper Pad, some designer paper from Cosmo Cricket Lil'Man, Handsome Henry and white and brown cardstock along with stamped images from the Story of Me Clear Art Stamp Set from Crafty Secrets. I started with a piece of cardstock that was 12'' x 9-1/2'', scored it at 6'' and then scored every 4'' going across. I cut out the center bottom panel so it would fold a little easier and also because I only wanted to have two pocket. Here is a picture of the inside of the card. I inked all of the edges for the Cosmo Cricket paper and also the orange on the inside of the card. 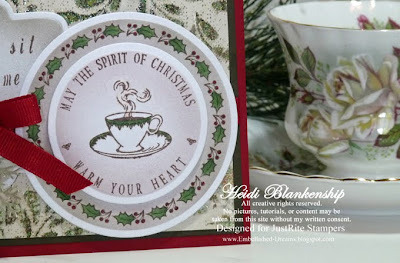 The diecut for the sentiment was made using the Large Labels S4-168 die templates from Spellbinders. Each pocket holds 6 book labels. For the front of the card I used a sweet little image from the Story of Me Clear Art Stamp Set from Crafty Secrets and colored it with Copic markers (listed below). I applied some foam tape to the back of the image to give it some dimension and then I also added some brown ribbon to the front to hold the card closed. Thanks so much for stopping by today! I hope you enjoyed the project I shared with you and please be sure to visit the Crafty Secrets Design Team Member (listed below) for today's Blog Hop!! I can't wait to see what they have created!! I hope you have a Fantastic Friday and a Great Weekend!! WOW What a weekend!! I am back home from ScrapFest at Mall of America and I can honestly say I have never experienced anything like it!! 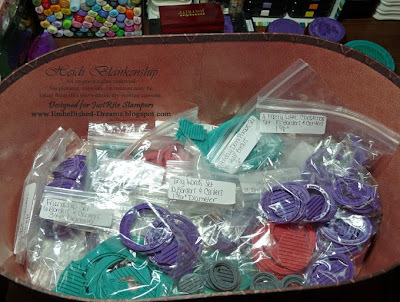 I went to ScrapFest with Spellbinders and Kim Hupke, Education Director and I worked in the booth doing make-n-takes for the event. The lines were never ending!!! The ladies would already be lining up when we arrived each morning to set up, greeting us with their smiling faces. We did a different make-n-take each day and the ladies loved it!!! 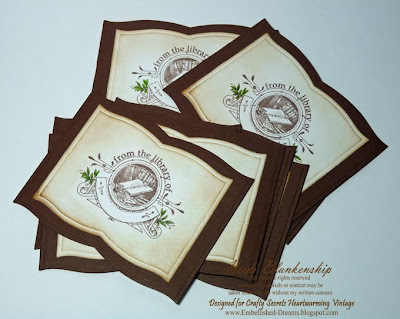 They were very excited about the products and what could be created with them and they also loved having a chance to have some hands on experience with the Wizard and Spellbinders Die Templates. It was so busy that we really didn't get a chance to take many pictures but here are a few that I snapped. 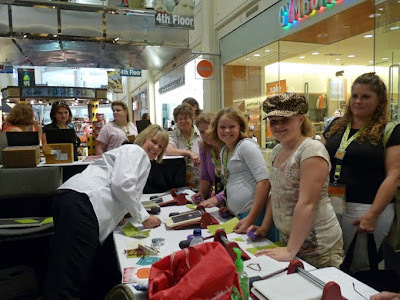 Here is Kim at the make-n-take table with a few of the ladies showing them how to use the Wizard. 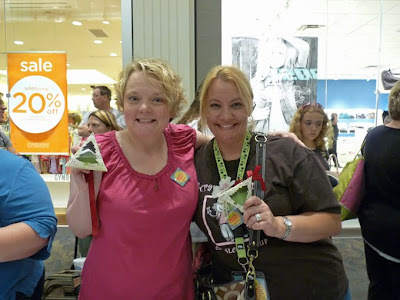 Here's a couple of ladies that were at my table and they were so excited to be at ScrapFest and having so much fun!! 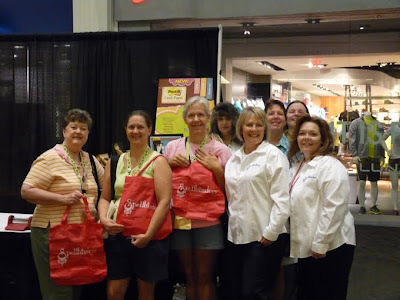 Lastly here we are with some of the ladies (and their cute pink Spellbinders bags) that were in line Sunday morning before the show started. While we were up in the Cities on Thursday night before ScrapFest we went to Scrapbooks Too and held a Spellbinders Event night. Sue Turchick, owner and instructor is the sweetest lady and she has an absolutely beautiful store with eye candy everywhere you look!!! We had such a wonderful time with all of the ladies at her store!! 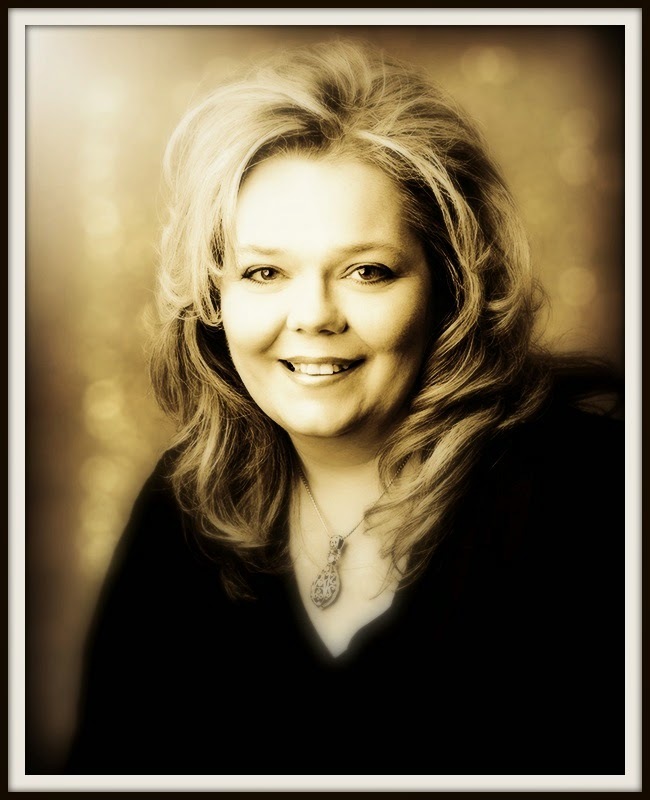 If you are up in the Bloomington, MN area or planning a trip to Mall of America you will have to stop in at Scrapbooks Too and say hello to Sue! 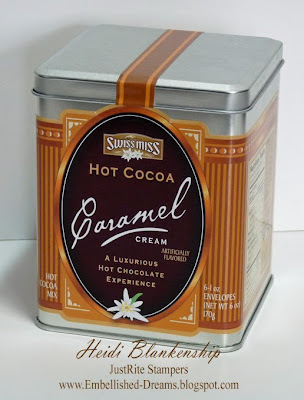 It has to be a quick post today--so much to catch up on! 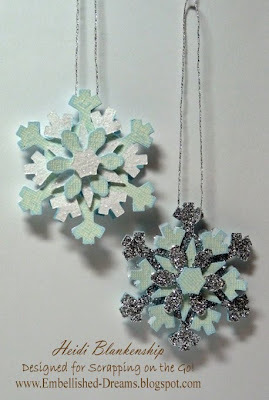 But please stop back tomorrow for this months Crafty Secrets Blog Hop! 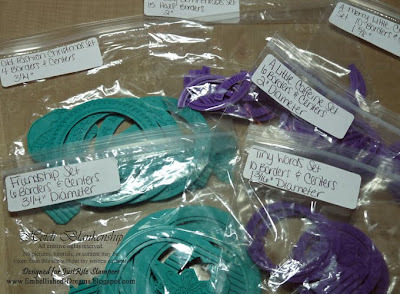 I am going to be teaching a class at Scrapping on the Go! October 3rd and I would love for you to come and join in the fun! 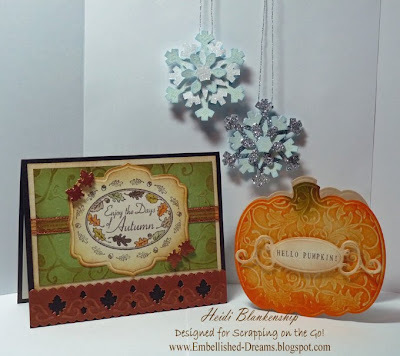 We will be making two beautiful fall cards and a snowflake Christmas ornament. 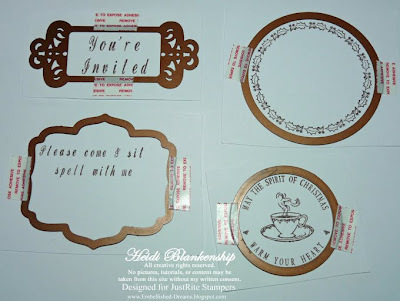 For the class you will get a chance to use some of the wonderful new products from Spellbinders Paper Arts and JustRite Stampers. Pictured below are the cards and the Christmas ornament we will be making for the class. Thanks so much for stopping by today and I hope you have a Wonderful Wednesday! 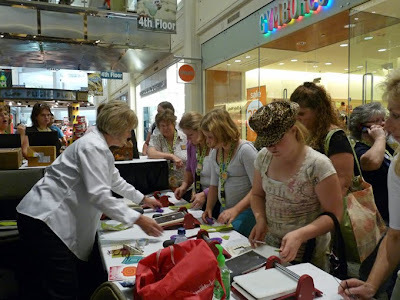 Are you going to ScrapFest at Mall of America? If you are I hope you will stop by and say Hello! I would love to meet you!! ScrapFest is September 18th - 20th. 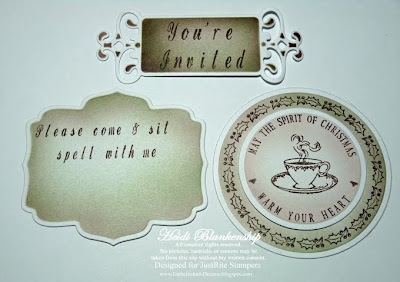 Kim Hupke, Education Director for Spellbinders Paper Arts and I will be at there to show you Spellbinders Products and to make some wonderful and fun make-n-takes. We will also be at Scrapbooks Too in Bloomington, MN on Thursday, Sept 17th!! Let's make it a long weekend and come join us for all the fun!! To read all the details and see the fun projects we will be making click HERE. Hope to see you at ScrapFest!!! PS~Stop back soon--I will be doing another post a little later this afternoon and I have some fun and exciting news to share and some new art. Hello! Before I get started with the blog post I just have to tell you I have some Fantastic news--I have the computer back!! I can't even begin to tell you how happy I am!! You just don't realize how much you depend on the computer until it's gone and then it about drives you crazy until you get it back--LOL! 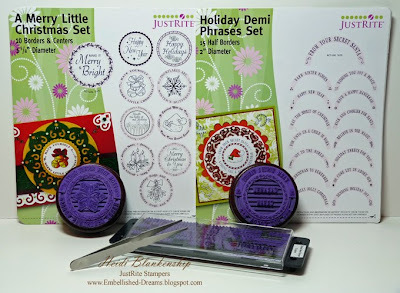 Today JustRite Stampers is the Product Focus at Splitcoaststampers and the product review team has written reviews on the 2" Stamper with 15 point Font, Holiday Demi Phrases, and the Have A Merry Little Christmas Set. 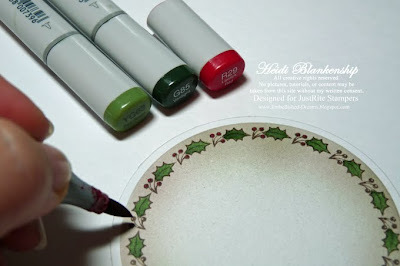 With these three items you can Custom design your own Personalized Christmas Cards. To read the Product Review click HERE. To see a written tutorial with great photos on how to use these products click HERE. 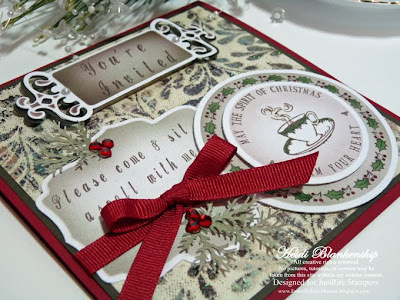 Also JustRite is having a Mini Christmas Card Blog Hop (names and links are listed below) and I know the ladies have all created something that is sure to inspire you. 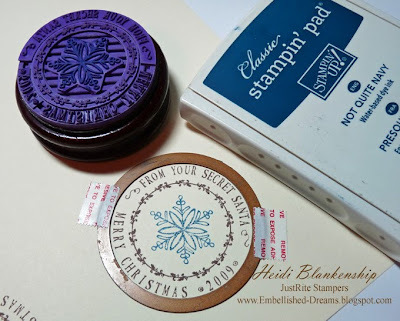 My project for today is on the simple side but I wanted to show you how quickly and easily you can personalize your gifts with JustRite Stampers and adding some pretty designer paper. Here is the card and gift I custom designed. 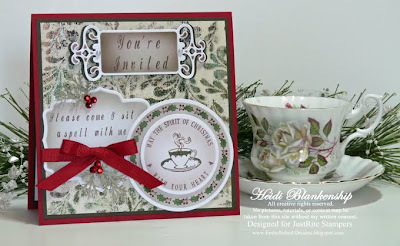 To create the card and tin I used the 2" Stamper with 15 point Font, Holiday Demi Phrases, and the Have A Merry Little Christmas Set from JustRite Stampers. Starting with the card here is the custom design stamp that I made. 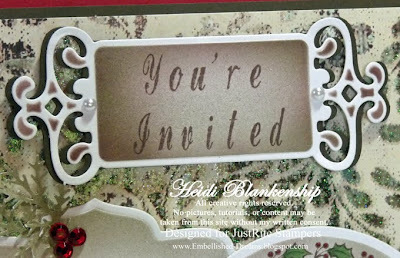 The snowflake and the center border are from the Have A Merry Little Christmas Set. The sentiment on the top half is from the Holiday Demi Phrases. 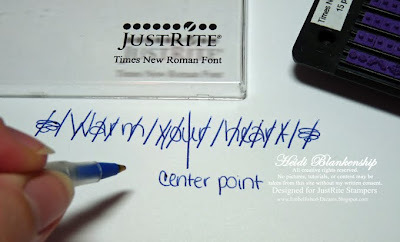 The letters to customize the stamp are from the 15 point Font set. 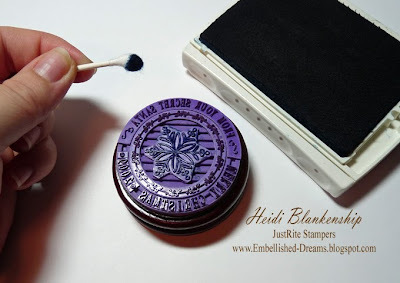 I started out by inking the stamp with Rich Cocoa Ink but I wanted to have the snowflake image blue so here is a little trick that I do when I need to remove or add a color of ink and I am working in a small space. I take a q-tip and tightly wrap a baby wipe around one end. 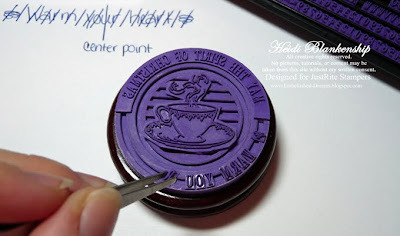 Then I used that to remove the ink from the stamp. 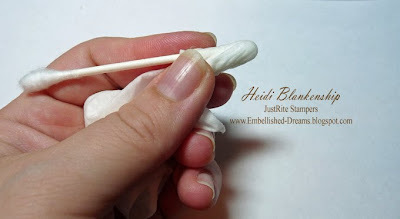 Then taking the other end of the q-tip to add the ink to your image. 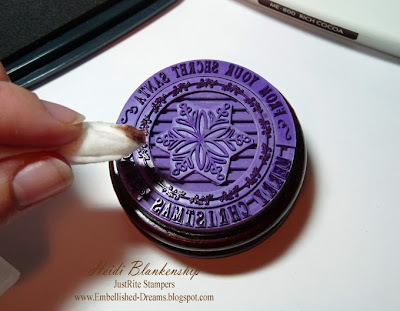 You don't want to wipe the q-tip on the stamp, just tap up and down the same way you would if you were applying ink directly to a stamp with an ink pad. Here is the finished result. I used the Classic Circles Nestabilities Lg. S4-114 to diecut the circles. I also used the Classic Petite Scalloped Circles Nestabilities Lg. 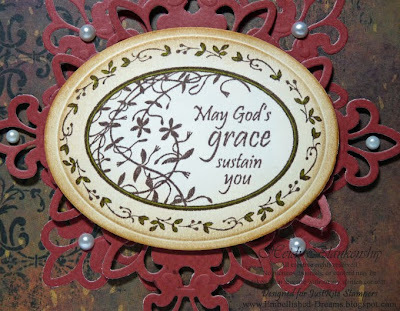 S4-115 to make a scalloped circle mat behind the image and sentiment. 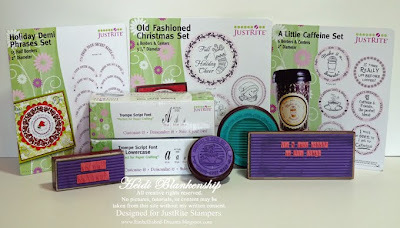 I hope you enjoyed today's blog post and maybe it will inspire you and get you thinking how you can personalize your Christmas cards and gifts with JustRite Stampers. Here is a list with links for the hop. 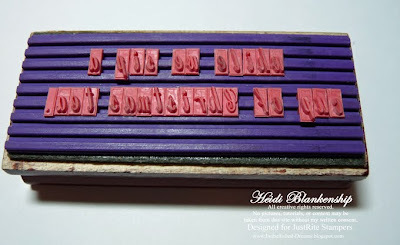 Also don't forget to check out the JustRite Stampers Blog!! Thanks so much for stopping by and I hope you have a Wonderful night! !